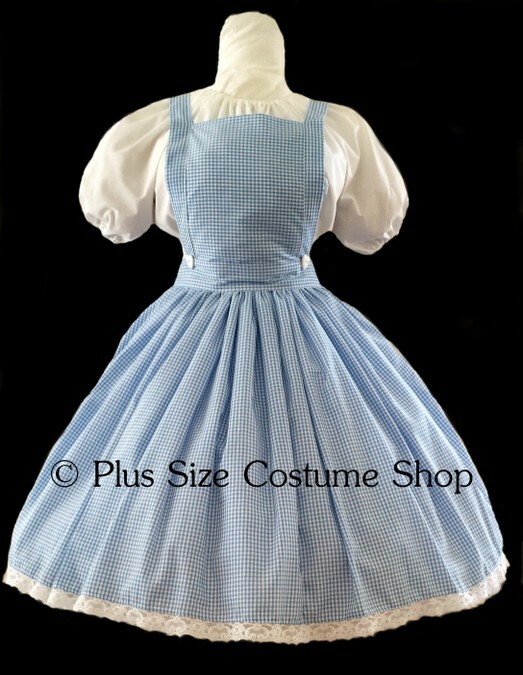 The skirt is made of blue and white gingham trimmed in white lace with an attached white net slip underneath. It has an elastic waist. The skirt will come hemmed at 28" (approximately mid-calf on someone of average height) unless a shorter or longer length is requested. The short-sleeved peasant shirt is made of white cotton and has elastic in the sleeves and neckline. The shirt length is approximately 32” or hip-length. The overall bib is also made of blue and white gingham cotton and ties at the back in a bow. There are two white buttons sewn on the front of the bib.